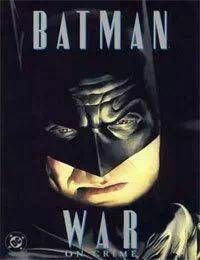 Alex Ross won the 1999 Eisner Award for Best Painter for his work on this title.<br />The second in the over-sized prestige-format tabloid collaborations between writer Paul Dini and Painter Alex Ross, Batman: War on Crime was just as successful as its predecessor, and just as beautiful. Beginning with a two-page origin story, this fully painted one-shot was told in story-book format. Like Superman: Peace on Earth, this story pitted its protagonist against seemingly insurmountable odds, in this case the cruel realities of those victimized by violent crime. A dark tale augmented by a bittersweet glimmer of hope, War on Crime was a tragic glimpse into the life of the man behind the mask.